I have developed a sudden interest in dice games. Not craps. Things like Dungeon Dice, Zombie Dice and Cthulhu Dice. I don’t know why. I have sudden spurts of interest in things. I once developed an interest in Goth Dolls. Thankfully that one didn’t last long. So while having all kinds of dice games rattling around in my head, I spent a sleepless night pondering things I could do nothing about. In an attempt to distract myself, I came up with a set of rules for a dice game. I got about 80% of the way there while lying in bed staring at the ceiling, wishing I was asleep. Over the next two days I have come pretty close to perfecting the rules. 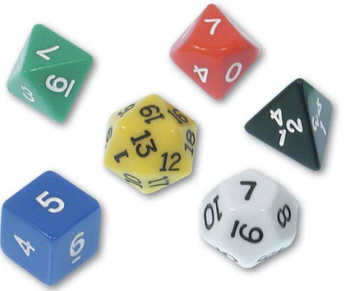 The game uses standard polyhedral dice (a set of dice with more than six sides for you non D&D literate types.) It has a leveling system, character classes, a quest system, and a player vs. player system. I’ve only play tested in a little bit, but the two people I’ve played with have both said it’s a challenging strategy game. That’s good, btw. I still need to do some more perfecting, but another week or two and I may have a full on game I developed. Still haven’t come up with a name though.